Located by Pioneer Square, Gallery 110 will feature a dual show with my friend David Haughton and myself. ‘Naughty‘ – Michael Abraham: Oil paintings on linen and bronze sculptures exploring facets of modern society, reflecting on ‘good’, ‘righteousness’ and ‘power’ – images of people who know their power but may not know their flaws, revealing an undercurrent of darker truth. This will include the latest painting, ‘Pants on Fire’, and the bronze ‘Satyr and Sunshine’ (Devil and Sun). ‘Bad Guys: Mug shots & Evil in Disguise’ – featuring David Haughton’s exploration of the “enduring power of the mug shot to transfix, upset, tantalize.” Taken from actual mug shots, Haughton’s paintings signify an attempt to discern whether evil can be seen, and if perhaps this is one reason why gazing upon the mug shot and the soulless eyes of monsters wearing human skin enchant us on some semi-conscious level. Let us know if you’d like to come to private wine and viewing reception, so we can order enough wine for you! Abraham’s paintings are both charming and disarming. 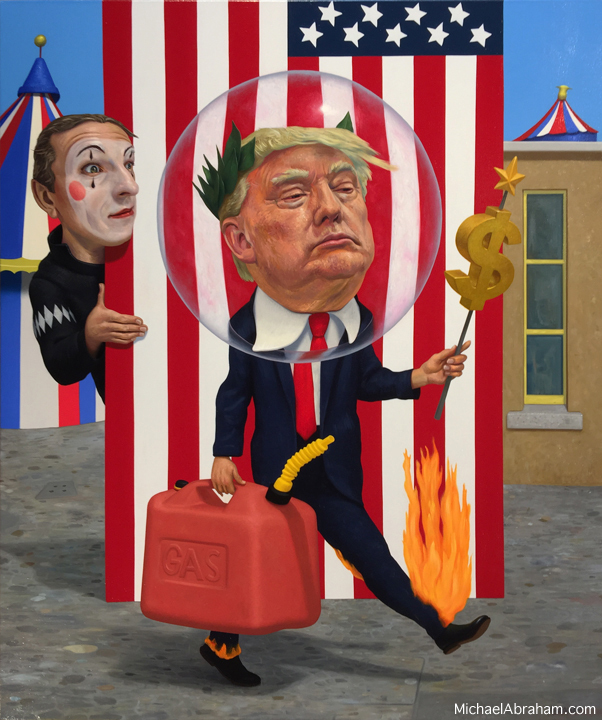 With a mischievous grin he wields his imagination on canvas… Michael Abraham says he deals less in social commentary and more in psychological realism (he deals in both). He shares his perceptions and incites with a good sprinkle of humor. The slight distortion of the figures percolates to the actions, which are mild to manic. Though helplessly terrorized as we confront his darker images, basically we know he means well, and like Breughel, he points to the indisputable foibles of mankind. Merging the inner and outer experience with creative freedom… If he can illuminate the dark corridors of our journey, he is requited and we are the beneficiaries. There is a duality of purpose and effect in Abraham’s work, especially those works chosen for Naughty. Each work confronts some level of angst regarding the dichotomy of light and dark, leaving the viewer consistently in an unsettling grey area. The villains of his worlds have good and bad in them, darkness and hope, their actions don’t necessarily define them, but merely shape our opinion of them. Michael Abraham will also be giving a talk/discussion, “The Role of the Artist in an Age of Conflict” that will touch on questions of the artist’s ability and perhaps even obligation to broach sensitive and substantive subjects in their work. 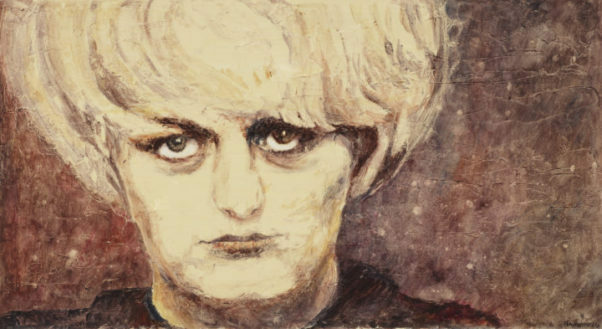 Viewing only David Haughton’s recent work, Bad Guys might seem a departure from his oeuvre, but this won’t be the first exhibition of Haughton’s that tackles difficult subject matter, even at the risk of disquieting the onlooker. His show Kindertotentanz (which translates to “children’s dance of death”) in 2009 bravely forced confrontation between the viewer and a reality representative of Haughton’s everyday life as a pediatric resident. Bad Guys continues a similar foray into the disquieting. Haughton acknowledges that which most of us can only tacitly admit to be true, which is our own fascination with the visualization and identification of the ‘bad’ or ‘evil.’ In Haughton’s upcoming exhibition, we see it in specific and individual faces we readily decry as ‘evil.’ Taken from actual mug shots, Haughton’s paintings signify an attempt to discern whether evil can be seen, and if perhaps this is one reason why gazing upon the mug shot and the soulless eyes of monsters wearing human skin enchant us on some semi-conscious level. David Haughton will be presenting a talk and discussion entitled “Why Paint Bad Guys?” intended to explore David’s shared fascination with what we see in representations of what we conceptualize as ‘evil,’ and the ways this fascination can serve as a coping mechanism for artist and viewer alike to deal with the darkness around us. Visit David Haughton’s website here.